A 1992 ‘Special Guest’ complimentary ticket. Supplied by Ben Wegner, Basingstoke. A 1993 Sunday Mirror promotional ticket. A silver Child ticket from 1993. On this page are examples of old tickets from Thorpe Park’s history. You can click on the description below each one to see a larger version. The Flying Fish on a 1995 ticket. supplied by Alec Dunn. Depth Charge on a 1995 ticket. 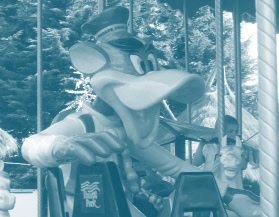 Loggers Leap on a 1995 ticket. Thunder River on a 1995 ticket. The back of a 1995 Adult ticket. Mr Rabbit on a 1996 ticket. supplied by Alec Dunn. Harley on a 1996 ticket. The back of a 1996 Grown Up ticket. The 1999 season was the first year that Tussuads were in charge of the park after buying it during 1998.
from 1999, show how the branding of the park and it’s logo were changed during this season. The ticket on left continues with old RMC ‘The Great Thorpe Park’ slogan and classic logo on the back. Where as the ticket on the right shows the park’s ‘new’ branding complete with the Splash logo. A 2002 Tussuads Group ticket advertising the Annual Pass for £70. A 2003 Tussuads Group ticket advertising the Annual Pass for £80. The back of a 2003 ticket. Content & Design of this site ©2010 - 2011 Memories of Thorpe Park. Thorpe Park is owned by the Merlin Entertainment Group.